Kwafubesi Tented Camp is located in the Waterberg region, and offers a host of exciting game activities and the opportunity to relax. Kwafubesi meaning 'place of the giant Eagle Owl' is located in the Mabula Private Game Reserve, offering you Limpopo accommodation. At Kwafubesi, you get a wildlife experience like no other. Witness spectacular golden plains and breathtaking sunsets, with the song of nature being the only sound around you. 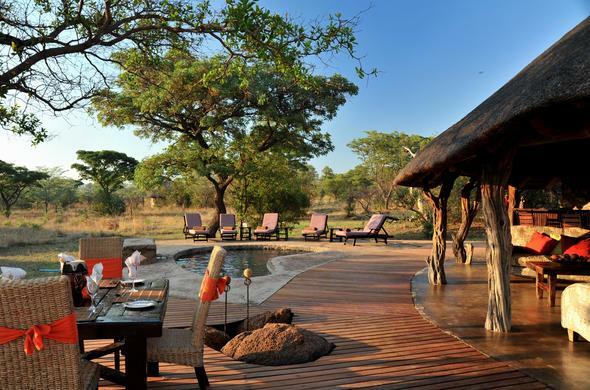 Home to an abundance of wildlife including mammal and reptile, Mabula also enjoy a rich plant life and insect colony. Here, all nature's wonders are revered, from the 'Big Five' (Lion, Leopard, Buffalo, Elephant and Rhino); to the 'Small Five' (Ant Lion, Leopard Tortoise, Buffalo Weaver, Elephant Shrew and Rhino Beetle). All activities at Kwafubesi are expertly handled by highly qualified and experienced game rangers. These activities are sure to awaken the senses and quicken the pulse of the guests staying at Kwafubesi's Limpopo accommodation. Meals at Kwafubesi's Limpopo accommodation are served in the romantic Lapa (dining area). For those special occasions, bush dinners have proven to be a most suitable alternative by combining the enjoyment of superb food with the tranquillity and captivating scenic beauty of the African bushveld.